Hello world, we’re Glass Gardens! Really excited to finally have a website up and running. I am very busy with preparing for my final examinations so the development and finishing touches of this online store will not be complete until the end of next month. Our name “Glass Gardens” is a synonym for terrarium. It basically describes a small plant feature created in a glass jar or bowl. 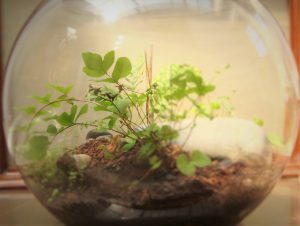 Terrariums are really interesting. They allow for the viewing and growing of small species of plants indoors. The glass jar or bowl creates a small ecosystem in which the plant can thrive. Just because of the design of the glass, water moisture is contained better than a plant in a pot. The primary use of a terrarium is often to house very fine specimens of plants, which are either extremely rare, or tropical. Most the terrariums I make are with succulents. I shall go into detail about succulents in the coming weeks. Thank you for visiting my site, and I hope that you get to share in the joy around keeping a terrarium. If you have a specific design or look you would like made, feel free to contact me. I also do large corporate events and weddings, should you require decor.